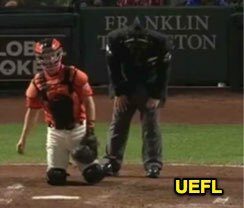 After a foul ball broke Brian Knight's left foot during the 6th inning of Friday's Dodgers-Giants game, the veteran home plate umpire remained in the contest until its completion, some 90 minutes and 110 pitches later. Knight was struck by a foul in the foot. In the top of the 6th, Dodgers batter Chris Taylor fouled several pitches from Giants starter Madison Bumgarner, one of which struck the toe portion of plate umpire Knight's left plate shoe, reportedly resulting in a fracture; Knight walked with a noticeable limp in the aftermath of the fateful foul. Knight remained in the game, with 1B Umpire and Crew Chief Gerry Davis, 2B Umpire Todd Tichenor, and 3B Umpire Pat Hoberg maintaining their positions in the field. In a coincidental turn of events, Knight was replaced at third base on Saturday by umpire Ed Hickox; it was Hickox in 2017 who suffered a season-ending foot injury as the result of a line drive in San Francisco. Related Post: Injury Scout - Hickox Out After Line Drive to Foot (7/26/17).